On 12 September, the United Nations University Institute for Sustainability and Peace (UNU-ISP) launched its 2011 Intensive Core Courses (IC), part of the UNU-ISP Master of Science (M.Sc.) in Sustainability, Development, and Peace, at UNU Headquarters in Tokyo. Running for six weeks (until 21 October 2011), the intensive courses aim to help create the next generation of international leaders and equip them with the skills needed to solve global challenges to sustainability. 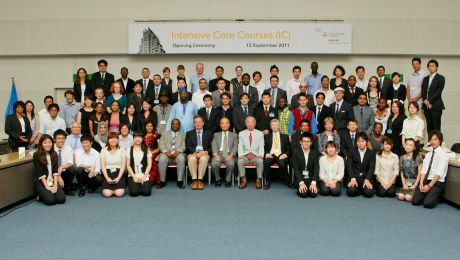 Some sixty students from diverse countries and backgrounds are participating in this year’s IC. They include 12 new students who have commenced the UNU-ISP M.Sc. degree programme and 4 students who are continuing into their second (and final) year of study. These are joined by 14 students from the UNU Institute of Advanced Studies (UNU-IAS) Master of Science in Environmental Governance (Biodiversity Specialization) programme and 31 other postgraduate students and professionals from around the globe. Students from developing countries are well represented, with 42 per cent of this year’s IC participants coming from Africa, 23 per cent from Asia, 18 per cent from the Americas or Oceania and the rest from Europe. One participant, Martha Kalemba, newly arrived in Japan from Malawi, said she was excited to start her studies at UNU. Martha, who works for the Department of Environmental Affairs in Malawi, will complete the intensive courses as part of her two-year UNU-IAS Master of Science in Environmental Governance degree programme. Kasundika Bandara, from Sri Lanka, shared these sentiments. “In Sri Lanka, we don’t yet have a solid environmental policy,” she said. Through her two years of study at UNU, she hopes to build upon her bio-geography background “to be able to play a more practical role in the future” in her country’s management of environmental issues and challenges. Pearly Wong, from Malaysia, who is also a student in the UNU-ISP M.Sc.programme, said she was attracted to study at UNU by the University’s “global reputation” for international development studies. “The integrative approach to the coursework and the chance to meet leading experts made this the best choice,” she said. Participants were warmly welcomed to UNU during the Opening Ceremony on 12 September by special guests that included Koïchiro Matsuura, Former Director General of UNESCO; Naoki Murata, Director-General, Public Diplomacy Department, Ministry of Foreign Affairs of Japan (MoFA); and Nobuo Fujishima, Director-General for International Affairs, Ministry of Education, Culture, Sports, Science and Technology of Japan (MEXT). Numerous UNU faculty and representatives of the diplomatic community also attended the event. The four courses offered in the IC — which all emphasize interdisciplinary perspectives — include UN Systems and Global Challenges, International Cooperation and Development, Global Change and Sustainability, and International Peace and Security. Students who successfully complete the IC will be awarded a certificate of completion and a transcript from UNU-ISP. Each specific course is designed to be worth 2 credits and comprises of 36 hours of teaching time. While a number of universities have negotiated credit transfer agreements with UNU-ISP, the decision on whether credits are transferrable will be made by the student’s home university. More information on the UNU-ISP M.Sc. in Sustainability, Development, and Peace programme. More information on the UNU-IAS M.Sc. in Environmental Governance programme.